Omega-3s are highly unsaturated essential fatty acids that are commonly found in seafood and fish oil supplements. They are called “essential fatty acids” because they are essential for life and health, affecting each of your body’s systems. However, the human body cannot produce them, relying instead on sources from your diet. Sadly, the typical modern diet is dangerously low in omega-3s. 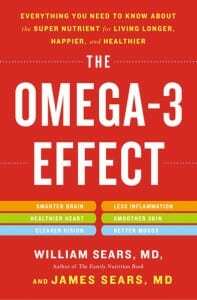 For in-depth information about the chemistry and health benefits of omega-3s, check out The Omega-3 Effect by Dr. Bill and Dr. Jim, released Aug 28, 2012.